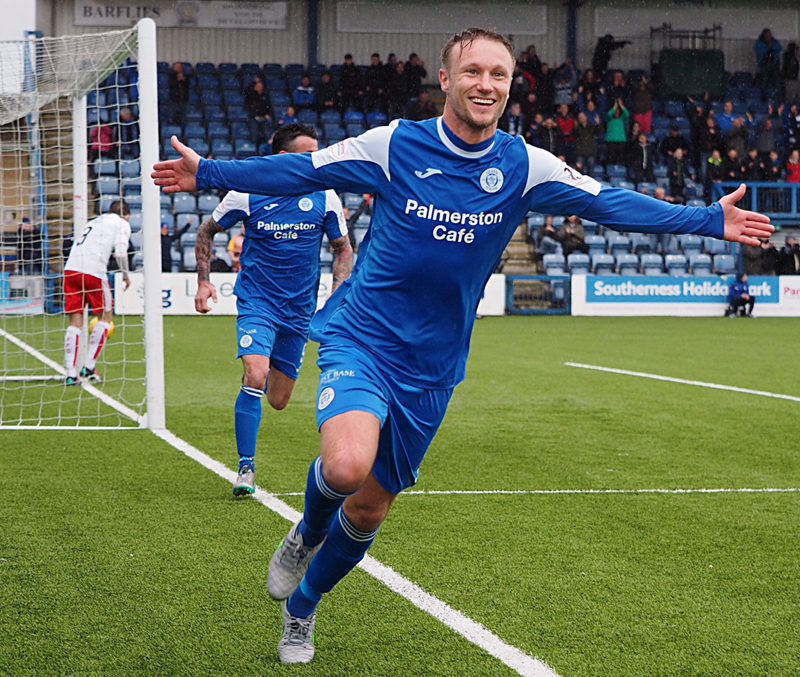 An injury time leveller from Iain Russell saw Queens grab a share of the points as they battled back from being two goals behind at a rain soaked Palmerston. After a fairly even first period, the visitors made the breakthrough right on the stroke of half-time, and when they doubled their advantage seven minutes into the second half, Queens seemed to be facing defeat. However, to their credit the home side rallied and after pulling a goal back with fifteen minutes to go, they were much the better team for the final stages and were rewarded with the late equaliser that saw them grab a point that earlier in the game, looked to be beyond them. Lining up in a 4-4-2 formation, with Higgins and Murdoch as the respective full-backs, Queens began defending the Portland Drive end and they were soon in trouble after some hesitant play offered up a chance for Miller, but his ferocious strike from the angle of the penalty area was helped over the bar by the finger tips of Robbie Thomson - the first of many good saves from the Queens `keeper. It was apparent from the early stages that Falkirk had identified the Queens right as being their main focus of attack, and on several occasions they threatened to get in behind the home defence via that route, and when Muirhead`s diagonal pass picked out Vaulks his progress was only stopped by an illegal challenge which led to a free-kick for the visitors. Although Queens defended that particular situation comfortably, it wasn`t too much longer before the visitors attacked again down the same side, this time Queens were back in numbers to prevent Leahy`s cross from reaching it`s target. The home side looked neat and tidy in possession with Tapping and Hutton competing well in the centre of the park, although on occasions the final pass, or decision often led to groans of frustration amongst the home support.Queens won their first corner of the game on 19 minutes, and from Alex Harris` delivery, Chris Higgins came very close to connecting with the ball at the near post.Following a quick break out of defence, Dale Hilson displayed good close control to skip past Leahy, but once again the final ball lacked accuracy as his pass to Harris was over-hit and the move was ended. 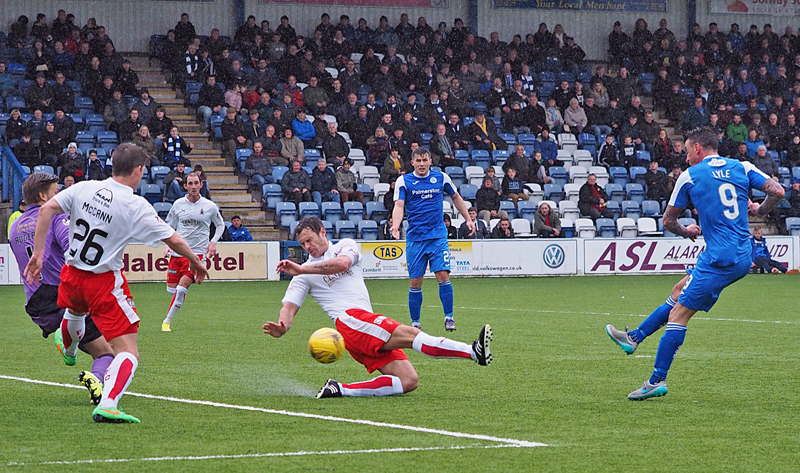 On the half hour, Falkirk almost opened the scoring, and once again the move came down the Queens right.Sloppy play saw Baird gain possession and after reaching the bye-line his pull back was inches away from being met by the onrushing Miller, another let off as Queens were opened up again. The front pairing of Baird and Miller were proving to be a real handful for Queens, and the pair almost linked up again moments later, only this time Baird`s driven cross had too much pace on it. At the other end the skill and speed of Hilson almost worked an opening for Lyle, but once again his final ball gave Lyle too much to do and the ball ran through to the `keeper. The best move of the first half almost produced the game`s opening goal, and it would have done but for an excellent reaction stop from Robbie Thomson. Again the break was down the Queens right as this time it was Leahy who made the forward run and when his cutback fell perfectly for Miller his first time connection looked to have given the Bairns the lead, but Thomson stuck out his left hand to push the ball to safety. 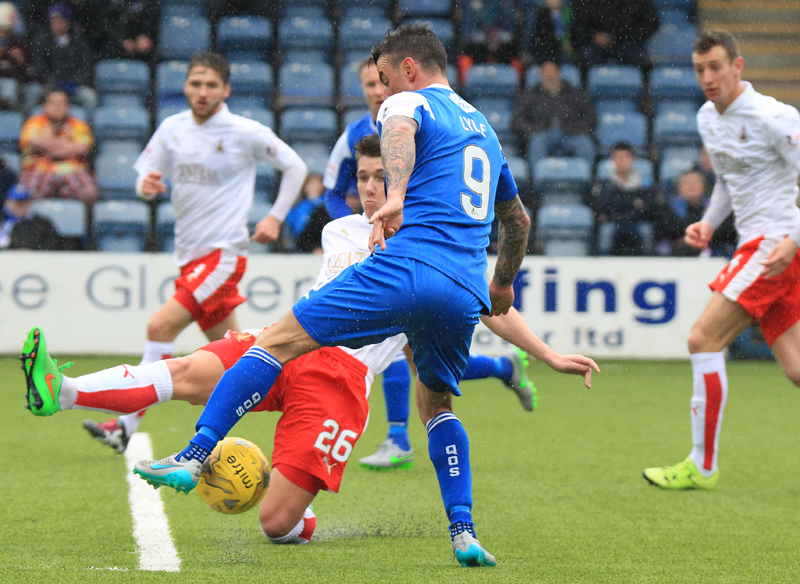 As the half moved into stoppage time, Queens switched off, and Falkirk moved into the lead. After conceding a throw-in, Queens failed to organise themselves properly - much the same as happened in the recent home game against Rangers - and from Muihead`s cross Alston was allowed to send a free header past Thomson and into the net.There was only time for Queens to re-start before referee Cook ended the half, a real sickening blow for Queens, but one that really should have been avoided. The opening incident of what would turn out to be an exciting second forty-five minutes, saw Andy Murdoch become the first player to be cautioned for a late challenge on Baird,and then just 7 minutes after the break Queens task got even harder when more sloppy defending saw them fall further behind when Vaulks seized possession of the ball before setting up Baird who smashed a low strike beyond the dive of Thomson. Losing the first goal the way they did and at the time that it happened, had clearly affected the home side, and now after another avoidable error had been punished, it might have been easier for Queens to just `go through the motions` until the final whistle, but to their immense credit, they dug in, re-grouped and began to take the game to Falkirk. That isn`t to say that it was all Queens for the last 30 minutes or so, but they certainly let Falkirk know it was game on. Firstly Harris raced clear down the left before slipping the ball inside to Hilson, and only he will know whether his ball across the face of goal was meant as a shot or a pass for Lyle, but either way it ended up being neither and the opportunity had gone.Hilson was then booked for what was an apparent kick out at an opponent,before Queens made their first change just past the hour mark. Iain Russell replaced Harris and was straight into the action as he got on the end of a wonderful pass inside the full-back from Tapping, but unfortunately for Queens, there were no takers for Russell`s inviting cross. The midfield contest was slowly switching in favour of Queens, and the longer the game went on, the stronger Kyle Hutton got as he grew in confidence.On several occasions he was on duty as the last defender, and his strength and determination to get on the ball were a major asset for his side. Queens replaced Callum Tapping with Lewis Kidd on 67 minutes and that forced a change in positions as Kidd slotted in at right back whilst Murdoch moved forward to a more accustomed midfield role.Hutton went close to scoring his first Queens goal with a low shot that didn`t miss by very much, while at the other end Queens were guilty of making hard work of clearing the ball and were somewhat fortunate to see Sibbald`s effort from close range flash wide of the target. As the play moved to the other end and moments after Queens could possibly have gone three behind, they found a lifeline and dragged themselves back into the contest. 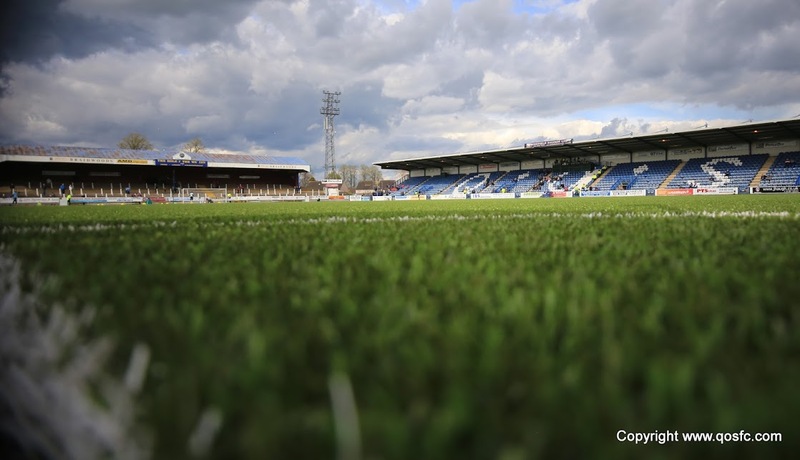 A high looping cross from the right was deflected in the penalty area and after watching the ball all the way, Derek Lyle controlled the ball, cut inside onto his right foot and drove the ball past the wrong footed Falkirk `keeper, to score for the 92nd time as a Queens player. 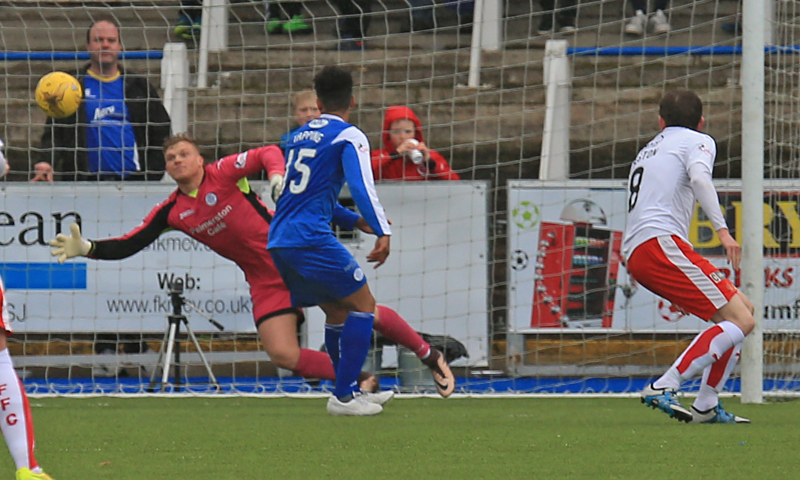 Boosted by the goal, Queens raised their game as they went in search of an equaliser, and Lyle almost got it after his glancing header from a deep free-kick bounced just a foot or so past the far upright. 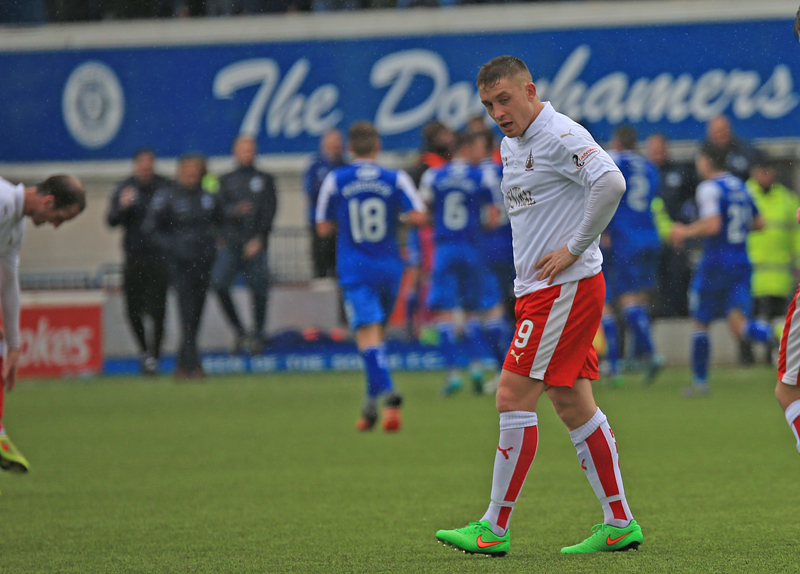 The final change for Queens saw Mark Millar replace Darren Brownlie and that also saw a switch in positions as Murdoch returned to right-back, Kidd moved to left-back, and Higgins moved into his familiar centre-back position. The next action saw Robbie Thomson pull off another fine save, this time diving to his left to push away Baird`s testing drive.At this point it was Queens who were asking all the questions. A foul on Russell gave them an opportunity from a free-kick, and although Miller`s ball picked out Higgins at the far post, the angle was too tight and the Queens captain could only guide his header wide.Derek Lyle almost scored his and Queens` second goal when following a flowing move involving Hutton, Oliver, and then Hilson,his attempted dipping shot was only just off target. Mark Millar was next to go close as he tried to reproduce his strike at Ibrox last week, and in fact he might well have done but for a good diving save from Rogers. 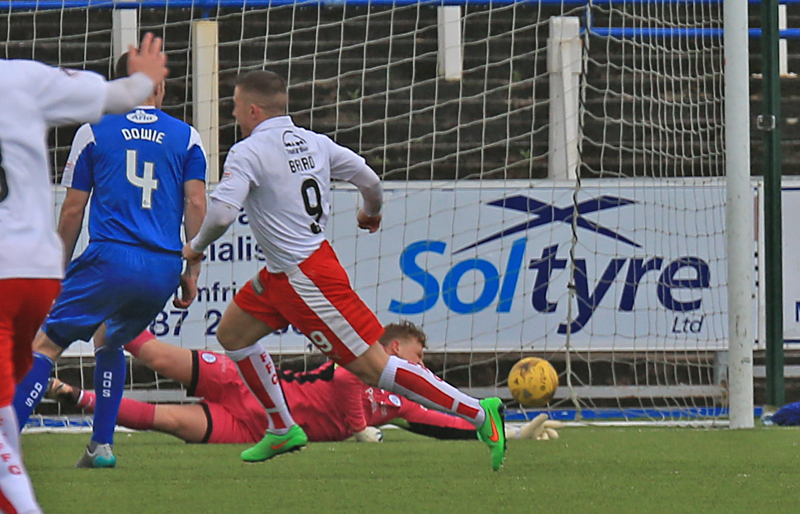 With Queens pushing for the leveller, and Falkirk holding on, there was a slight moment of concern for Queens when Sibbald fired into the side netting from close range, but just when it seemed as though Queens would be on the end of another defeat, deep into stoppage time they drew level. A move down the right seemed to have lost it`s momentum but Millar took control of the ball and rolled a perfect pass into the penalty area where, unmarked and from 12-yards out, Iain Russell curled a low right footed shot past Rogers to tie the game up. It was a decent comeback from Queens and probably a draw was about right but they almost threw the game away right at the death, when a quickly taken free-kick set up a chance for Sibbald, but he rushed his shot and the ball flew well wide of the target. So the game ended with the same 2-2 scoreline that occurred back in November - same Queens scorers as well - and although games between the sides have all been close this season, the current 24 points gap is huge.Kyle Hutton was named man-of-the-match and it would be hard to disagree with that decision, although Robbie Thomson must have run him close. Five games to go now and although mathematically 4th place is still available, I don`t think even the most ardent of Queens fans will think it`s going to happen, but with Raith visiting next week, it would be good to keep them waiting.....at least for one more game.